A technique to create multi-coloured 3D images that can share space with physical objects has been developed by researchers in the US. 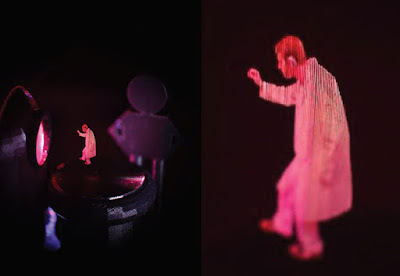 The work is at an early stage, but it offers several potential advantages over currently available techniques for creating 3D images such as holography. The technology used by the android R2D2 to project the 3D video footage of Princess Leia pleading "Help me, Obi-Wan Kenobi: you're my only hope" into thin air was never explained in the film Star Wars. Scientists, however, have invented several technologies capable of producing the impression of 3D images. The best known, and most widely used is holography, in which a 2D surface sends light to the eye in such a way that the brain reconstructs this light as having come from a 3D object. Unfortunately, this optical illusion only works for a fairly narrow range of viewing angles: "Holograms and displays like them are based on 2D modulating surfaces that have to be looked at like a TV screen," explains Daniel Smalley of Brigham Young University in Utah, "You always have to be looking into the screen to see it." In a volumetric display, however, the light originates from where your eye sees the image. Such displays have several advantages over holograms. As the image does not rely on an optical illusion, for example, it is unaffected by the viewing angle. "You can be lying flat on the ground and you can see what's coming up out of the display," says Smalley. Furthermore, it is (at least in principle) possible to wrap the image around the viewer or another physical object.